…and by HIIT, I mean we did High Intensity Interval Training. An amazing way to improve your cardio, jack up your metabolism, and get a serious sweat on! So, what’s a HIIT? That would be alternating periods of short but intense anaerobic exercise followed with less-intense recovery periods. A HIIT session consists of a warm up period of exercise, followed by six to ten repetitions of high intensity exercise, separated by low/medium intensity exercise, and ending with a period of cool down exercise. The high intensity exercise should be done at near maximum intensity. The low/medium exercise should be about 50% intensity. The number of repetitions and length of each depends on the exercise and can be increased each week. The goal is to do at least six cycles, and to have the entire HIIT session last at least fifteen minutes and not more than twenty. Here’s what we did today – give it a try! Cool-down: 10min jog followed by a stretch. 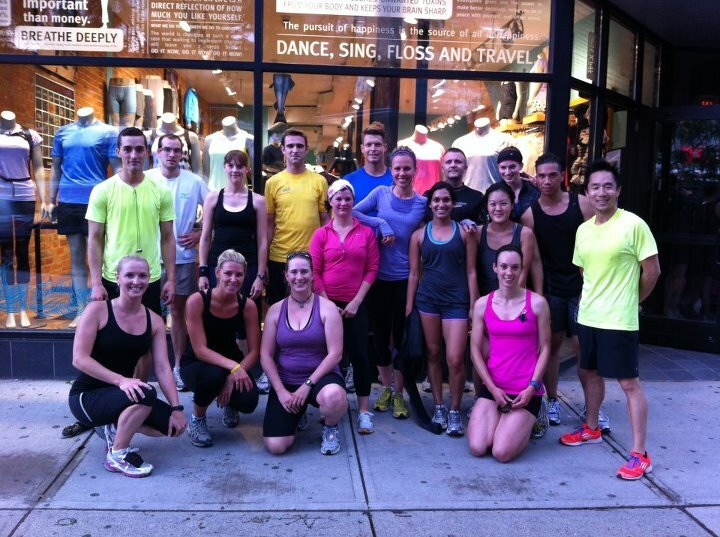 If you’re in Toronto, join me and the “fastest kids on Queen Street” every Wednesday at 6pm for a complimentary 5km run club at lululemon Queen St. West – All levels are always welcome and encouraged!